The first step in determining your hearing capability is to complete a diagnostic hearing evaluation. The results of the evaluation will detail the extent, type, and specifics of your hearing loss. Audiologist Cindy Weber will perform the hearing evaluation using equipment called an audiometer. Weber recommends new patients bring a supportive family member to the evaluation appointment to help you understand the information and treatments recommended. 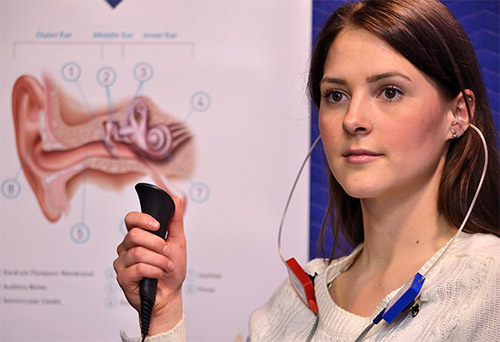 The diagnostic hearing evaluation includes several tests to determine the level of hearing loss, as well as the level at which a patient can detect and understand speech. Most health insurance policies cover the diagnostic hearing evaluation, though you may need a referral from your primary care physician to qualify for coverage. Why is a Diagnostic Hearing Evaluation important? Hearing evaluations are important in helping the audiologist determine the best form of treatment. Some types of hearing loss can be treated medically or surgically, so it's important that these types of hearing losses be ruled out before hearing aids or other treatments are considered. If a hearing aid is the recommended form of treatment, the diagnostic hearing evaluation will help the audiologist know which hearing aids will be most appropriate for your needs. Most hearing evaluations last about 30 to 40 minutes. If it is determined you require hearing aids, allow for sufficient time to discuss your options with the audiologist. At the start of your appointment, the audiologist will review your complete medical history with you and also discuss any concerns you have about exposure to noise, tinnitus and balance problems. Please bring a list of all medications and supplements you are taking with you to the appointment. Rest assured, you will receive the highest level of customer service at Alutiiq Hearing. Cindy Weber will listen carefully to your concerns and answer all of your questions. Her goal is to match you with a hearing solution or treatment that works best for you and improves your overall quality of life.